« Is quadrification of left main possible ? Why the future looks bleak for our patients . . . unless some drastic things happen ! It is often said optimism is key to success . From the patient’s and physician’s perspective it is the willpower that has saved many lives. Positive minded patients do not die without fighting. We know self belief can do wonders in medical care ! If self belief is the ultimate healer , trusting the doctor and the hospital are equally important . Patients believe in doctors and doctors believe in science . Science is not sacred .It is man-made .Those men who create science need not be holy either ! Can we trust modern medicine in the current form ? I am afraid the answer is too tilted towards . . . “No” I am not a pessimist in the strict sense . However , the future looks bleak in most places ! unless some strong remedial measures are under taken. Statistics suggest , patients are rapidly losing the belief in their physicians , considering the track record of our health care management in recent times . 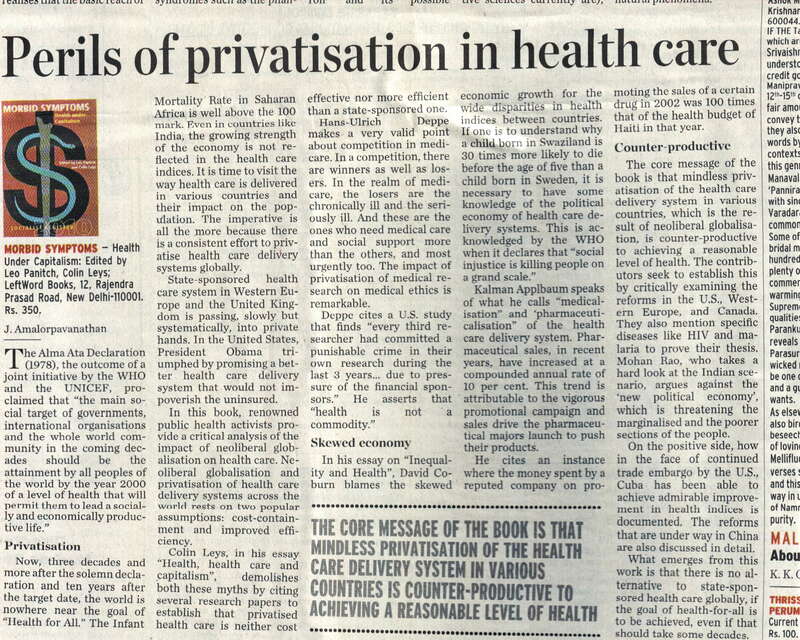 Global trends in the last 5 decades indicate the health care delivery system has gradually been hijacked from the Govt to the private hands. It is quiet a shocking revelation , the private sector health care has done more damage than the state driven health care . How foolish our expectation can be ! For fulfilling the millennium goal ( Health for all ) most countries have handed over the baton to the greedy corporates . How on earth , one can expect the private / corporate sector to provide equitable health for all . It would be wealth for all those involved in this flawed medical care system at the cost of poor ! Read this book . . .To understand the nuances of how our health care industry is bulldozing , like an army tank into the population and most of us is a victim or a partner to this . Entry of capitalism into health sector is probably the worst infliction man kind has suffered , than all those deadly viruses and bacteria over a last few centuries ! Medical science is a phenomenal gift created , nurtured and grown by the sixth sense of our ancestors .Their only aim was to provide relief to the sufferings. Now their dreams, vision and goals lie shattered . No hospital has a specialty called “humane care” , while many have a separate department to do a neuro metabolic imaging for a depressed man with Alzheimer disease in his nineties and a Bio – Robot driven fuzzy logic lab to predict cardiac events in a soon to die rich man . Absolute waste of resources ! There is no doubt , we have become a sort of salves to science . . . (Irrational science to be precise ! ) It is a man-made monster. Even a most conservative person (including the author ) could be causing some damage as we are forced to follow the unruly scientific publications . Probably . . .yes . . . we can’t eliminate it but identify futility of modern science try to get rid of it . ! Those were the days . . . When doctors practiced medicine . . .and much more . . .
What ails our health care system today ? Do not be part of it . . . solutions will come automatically !